Preparation for the scanning at The State University Hospital in Copenhagen. The 21 electrodes connected to the EEG are in place on the head. Now, all that are needed are headphones for Yoga Nidra. Only the person being measured is in the room when the scan begins. Researchers have, for the first time, succeeded in taking pictures of the brain during a meditative deep-relaxation, with as short a scanning time as one minute per image. The pictures were taken by one of the most advanced medical research instruments, the PET scanner, at The State University Hospital in Copenhagen. The initiators were researchers, Dr. Hans Lou and Dr. Troels Kjær from the Kennedy Institute in Copenhagen. Published in 1999. When they contacted us, they said they wanted to measure awareness! But how do you do that? At the Scandinavian Yoga and Meditation School, we have previously collaborated with a number of researchers who were examining the effects of yoga’s breathing exercises on blood pressure, among other things. We have also measured participants for six consecutive years, at Haa Retreat Center, to determine the effects of the Three Months Retreat on the level of cholesterol in the blood, on the body’s hormone balance, and on the balance between the two brain halves; as well as the result of awareness training, for instance, on the reduction of fear in a normal person. To actually measure consciousness and how the brain functions by conscious control of awareness, was, however, quite new for us. At first, we proposed that people doing Kriya Yoga could be measured. This is a meditation which has given very distinct results in other studies (see Mapping the brains activity after Kriya Yoga). However, at present, it is only possible to lie down in a PET scanner, so a person sitting in a meditation pose cannot be measured. We therefore agreed with the researchers to measure people practising Yoga Nidra from the CD Experience Yoga Nidra, guided by Swami Janakananda. This also ensured that all those who were measured did exactly the same thing. We limited the research to those who practised Kriya Yoga regularly – they were to do Kriya Yoga in the morning, before going to the hospital to have brain scans. The subjects lay, one at a time, in the PET scanner. It takes just one minute to gather the data of the brain scan, but there must also be an interval of ten minutes before the next scan can be made. Eight pictures were produced from the scanned material. They show which areas were active before (one picture), during (four pictures) and after Yoga Nidra (three pictures). 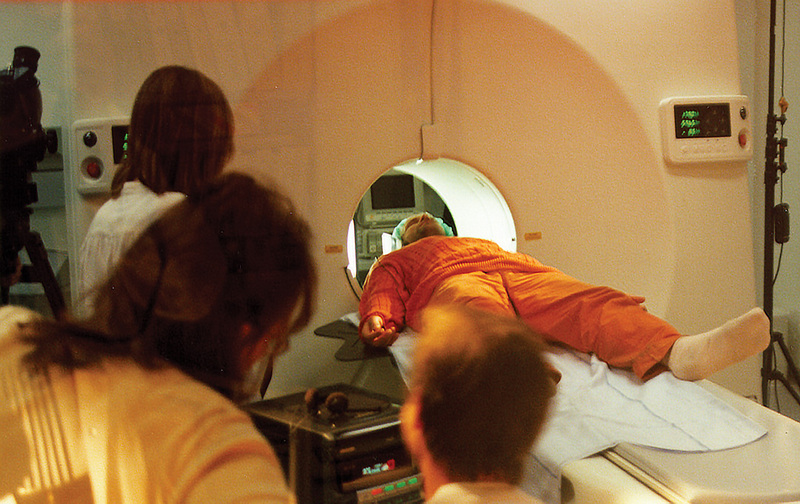 The person lying in the PET scanner is not disturbed by the procedure, but practises the Deep Yoga Nidra without pause from start to finish. Also, during the whole procedure, the brain’s activity was being measured by an electroencephalograph (EEG, see The relaxed state and science). The EEG curve showed, as expected, that the subjects were in a meditative state during the entire Yoga Nidra. Afterwards, the images were resized into the standard size (Talairach space) to ensure that they are proportional and that the different areas of the brain are exactly in the same location, regardless of the subjects’ differences in brain size and overall shape. The data from the pictures was compared and the mean values calculated. Pictures were taken of a normal waking state with closed eyes, as well as of four different practices in Yoga Nidra. By comparing this data and eliminating the normal activity from the activity during Yoga Nidra, it is possible to see which areas of the brain were stimulated by the relaxation. And in order to discover what is characteristic of the normal state, in comparison to the state of Yoga Nidra, the values of the pictures taken before and after Yoga Nidra were combined, and then the values of the four pictures taken during Yoga Nidra were subtracted. Now, the researchers wanted to see the difference between the various sections of Yoga Nidra. While the first picture was being taken, the subject was experiencing his/her body, especially the various parts of the face. The next image was taken during the experience of happiness and contentment, the third during the experience of a summer day in the countryside and the fourth at the end of Yoga Nidra, during the experience when asked “who am I”. The sampled data showed that the more ‘concrete’ tasks, such as the experience of the body and the landscape, activated more or less the same regions in the brain (fig. 4); while the more ‘abstract’ tasks, such as experiencing happiness and who am I, activated other regions (fig. 3). Increased dopamine production, up to 65%, while listening to the CD “Experience Yoga Nidra” by Swami Janakananda. An article about the scientific study conducted in London is under preparation, with contributions by the people who were measured in the research. The first scientific study; “A 15O‐H2O PET study of meditation and the resting state of normal consciousness” (Hans C. Lou, Troels W. Kjaer et al. ), done in Copenhagen, is published in the magazine: Human Brain Mapping , Volume 7 Issue 2, pages 98-105, February 1999. The second study; “Increased dopamine tone during meditation-induced change of consciousness” (Troels W Kjaer, Camilla Bertelsen et al. ), done in London and Denmark, is published in Cognitive Brain Research, Volume 13, Issue 2, April 2002, Pages 255-259. Unfortunately in this abstract the writers have not clarified that, what they call the “meditation”, is actually the Yoga Nidra. However, this is clear in the paper itself. The measurements of the brain’s activity (EEG) indicated that the subjects were in a deeply relaxed state, similar to that of sleep, during the whole Yoga Nidra. The theta activity rose significantly (11%p) on all the twenty-one electrodes. The reduction of the alpha activity (2% NS) was insignificant, showing that this meditative state is altogether different from that of the sleeping state and comprises conscious awareness. Furthermore, the state was constant and evenly distributed over the entire brain for the forty-five minutes the relaxation lasted. The research took one and a half hours per participant. During that period, the person lay completely still in the same position. When the state prior to and following Yoga Nidra – where one just lies and rests – was compared with the state during Yoga Nidra, the measurements showed a significant difference between the two states. This confirms the importance of using a technique if one wants to achieve results, such as those described in this and other Bindu articles. 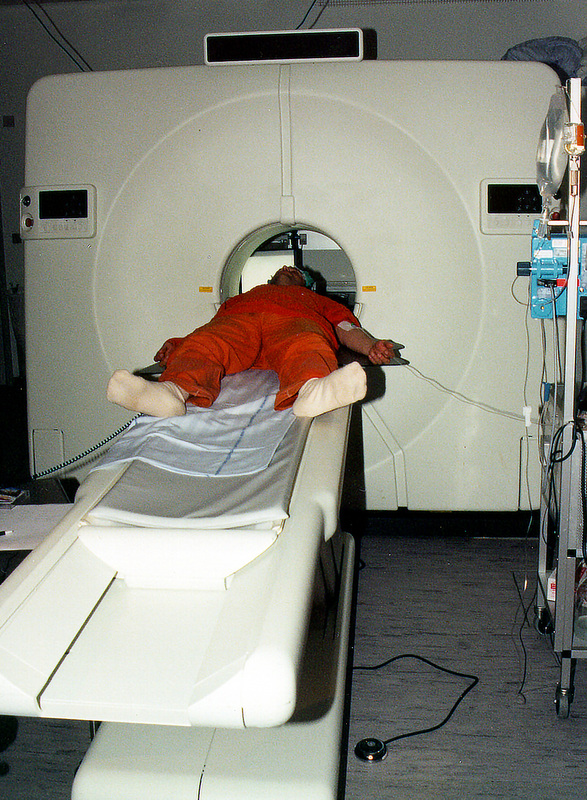 The PET scanner’s pictures show that the subjects were not in a drowsy or unconscious state during the relaxation, as one would expect of a person in such a deep state. The participants remained considerably aware of what was happening. It is clearly visible how specific regions of the brain were activated sequentially, according to where the subject was in Yoga Nidra. What happens in the brain during Yoga Nidra or where it happens is not a matter of chance. There was a significant similarity between the pictures of the seven yoga teachers who were measured. Something that may seem paradoxical to those who have no experience of meditation, is the fact that these clear results, which reveal a high degree of concentration, are brought about entirely without effort. While you are lying in Yoga Nidra, you are not trying to force the various things that you experience. On the contrary, as the EEG shows, you are completely relaxed from start to finish. You just listen to the instructions and experience clearly what happens, as a child listening to a fairy tale – actively participating, but without effort. The results confirm the experience of the yogi: Concentration is a spontaneous state, which comes of its own accord when a method is used that removes whatever is hindering it. Consciousness during Yoga Nidra is in a very deep and stable state. The measurements show, for the first time, that one can be completely aware in such a deep state – that one can consciously experience and control the brain’s activity simultaneously. This confirms that meditation is the fourth major state, equal to dreaming, sleeping and wakefulness. The results can therefore be said to be very important news within this field of research. This picture is based on the data gathered prior to and following Yoga Nidra. It illustrates the state closest to normal waking consciousness, though without being a tired or stressed state. Those who use Yoga Nidra remark that not only do they get something out of the deep relaxation while doing it, but that it has a definite beneficial effect on the remaining part of their day. management, which is active. One of its capacities is to ensure that we can function in a complex society, as it processes the signals from the deeper emotional and instinctive regions of the brain. The brain stem and the cerebellum are also active, indicating that one is ‘ready for action’. This picture shows the general state during the entire Yoga Nidra. The visual centre at the back of the head and the somatosensory centre at the top of the head (for the sense of touch and body position) are active and are in contact with the limbic system. This implies an increased ability to visualise and, more importantly, that there is better contact with emotions. Some of the teachers also had distinct activity in the centre for long term memory, which is consistent with accounts from people who meditate, that very lucid memories can appear during or after a meditation. We must, however, emphasise that the subjects’ experience and regular use of Kriya Yoga possibly intensifies the effects of Yoga Nidra. This picture is created on the basis of measurements taken during the feeling of happiness and at the end of the relaxation during the experience of identity, of being centred. During these ‘abstract experiences’ in Yoga Nidra, the centre for speech and language was especially active. It must be said, however, that this and the next picture only show the areas where the most activity occurs, and not the general activity in the whole brain, as is shown in picture 2. It was primarily the visual and tactile centres which were active as the subjects went through the body’s different parts (especially the face) and also when they experienced a pleasant summer day in the country. When looking at these pictures (1, 2 and 4) one must bear in mind that the luminous areas are within the brain, and not only on the surface of the cerebral cortex. In picture number three, on the other hand, the activity is in the cortex. All active areas were basically the same, that is symmetrical, in both brain halves. The pictures of the brain were taken in a PET scanner (Positron Emission Tomography), which measures the flow of blood through different parts of the brain. This is done by injecting water with a weak radioactive trace into the blood stream. Tomography is derived from the Greek word tomos, meaning section. In the PET scanner, numerous 4.25 mm thick sections of the brain are registered, giving a three dimensional picture of the brain’s activity. When one part of the brain is particularly active, the flow of blood increases, and by comparing several pictures it is possible to see where the brain’s activity rises under certain conditions. Why it is interesting – a comment by psychologist Ronny Öhrnell. The EEG measurements have previously only been one dimensional – skin resistance, blood pressure etc. – and have only shown that the state changes. That means that a perpendicular dimension has been described, for example a deepening of the state. On the other hand, it has not been possible to measure or substantiate the content of that altered state. With this latest research, a horizontal dimension is added to the measurements of the altered state of consciousness, giving it life. What occurs on the deeper levels of consciousness can now be measured and shown. The research shows that some sensory centers in the brain are active, but that activity is internal. From our own experience, we know that internal experiences are more changeable than those we see and hear through our senses in the reality around us. Our thoughts, our imagination and our dreams continuously take on new forms. When we allow these centers to be involved with the inner experiences, without being aware of anything from outside, where then do the impulses come from? From deeper planes? From the surroundings, after all? Or are they formed there, in the sight and touch centers? Does the language center have the same function on the deeper inner plane? Or does it have other functions? There is a new world to be discovered here. It can be done by taking measurements and by combining the measurements with the account the meditator gives of what he or she experiences along the way. The research also confirms a lot of what was previously described about relaxation and meditation by people who knew it through their own experience – and that what you experience within, is another reality to that of the external senses, which to a degree obey different laws.